When thinking about going on hiking, there’s nothing more important than taking all necessary steps to protect your skin from the sun’s harmful rays. There are many ways you can protect your skin including wearing lots of sunscreen and UV protective clothing. But the most practical way to protect the skin from the sun while on a hike is by wearing a hiking hat. The best hiking hat is specifically designed with hikers in mind. They give you the ultimate freedom, mobility, and protection you need when climbing a mountain or through a forest. An excellent quality hiking hat should be an essential part of your hiking or outdoor wardrobe. These hats don’t only have to be used for hiking; they can also be used for various outdoor activities including camping, gardening, bike riding, walking or going to the beach. These hats’ versatility makes them a good investment that will last you for years to come. Using this guide, you can find the best hiking hats for your individual hiking and sun protection needs. Below you will find things to look for when buying a hiking hat, and the six best-hiking hats available online. Make your next hiking trip a sunburn free and protected one with this easy to follow hiking hat guide. There are things you need to consider like the way it looks, the way it fits on your head, the color, any additional accessories like a strap or snaps, and most importantly the brim. Some hiking hats have colossal and wide brims that are the best for all over protection for your head, face, neck, and shoulders. Those big hats don’t provide you much mobility and are best for lower intensity hikes, and other outdoor activities like camping. Hats with smaller brims are often called bucket hats, because of their resemblance to a bucket. These hats will allow you to remain more active, while still providing decent protection from the sun. Some smaller brim hats don’t completely cover the entire area of your lower face, neck, and shoulders, so make sure you still put on plenty of sunscreens when doing outdoor activities. Not to worry, you can still enjoy your sunny hikes wearing a UV protecting hiking hat that will save your skin from any sun damage. The best hiking hats are the ones that provide you with ultimate UV protection. Hiking Hats are rated with a UPF (ultraviolet protection factor) rating. These can range anywhere from 30+ UPF to 65+ UPF. When choosing a hiking hat, you want to get one that is at least 30+ UPF or higher to protect your delicate skin from UV rays. Unlike sunscreen that has the same UV blocking qualities as a hiking hat, hats don’t wear off after a couple of hours or disappear when you get sweaty. Bugs are pretty annoying, but they are even worse when you’re trying to enjoy a nice hike and capture the views. Hiking hats can help with protecting your head and face from mosquitoes and other bugs too. With the wide brim and extra coverage, hiking hats can deter insects from landing on your head and face. Everything from mosquitoes, to ticks, flies, and bees won’t stand a chance when they try to penetrate through the sturdy canvas of your hat. You want a hat that is made of water and sweat repellent material, so you don’t have to worry about it getting weighed down if you strike up a sweat or you get stuck in a downpour. A simple test of durability is to crumple the hat up in your hands. A good quality hat will bounce back and retain its shape when crushed, while a poor quality one with remain in a ball. A hole in your hat during the middle of a hike is not a fun thing do deal with. If you go hiking with a poor quality hat, you risk unnecessary sun expose and damage. We suggest looking for hats made out of sturdy materials such as nylon for the best durability. You can avoid all these problems and worries with a high quality, durable hiking hat that is sure to withstand even your toughest hikes and last for years to come. It’s best to measure the circumference of your head with a measuring tape and use it to follow each company’s specific sizing guidelines to ensure you receive the best fitting hat for you. Another good idea is to get an adjustable hat that can last for many years and head sizes. When you’re hiking in warmer climates, you’re going to sweat. That’s why it’s important to get a hiking hat that allows for air circulation and doesn’t cook your head inside. If you don’t consider breathability and weight when purchasing your hiking hat, you’re going to end up wringing out a hat dripping with sweat at the end of your hike. A lot of hiking hats are made with mesh sidings that allow for a nice airflow to keep your head cool. Others are made with sweat resistant materials similar to that of workout sports gear, that won’t absorb your sweat and cause you to overheat. Listed below are six of the best hiking hats available on the market today. They range from weight, size, and features, but all are great options to provide you with the utmost protection and comfort as you hit the trails. The Sunday Afternoons Adventure Hat is a great hat for its moisture wicking, water repelling abilities. This hiking height is very lightweight at only a pound, which is absolutely what a regular hiker needs. The hat is made of 100% polyester and is likely to keep your head cool in even the hottest of climates with its two mesh vents on either side of the head. Not only will the Sunday Afternoon hat keep you cool, but it will protect you from the sun while doing so. This hat boasts an incredible UPF 50+ rating (not including the mesh vents), 4-inch front brim, and a 7 ½ inch neck flap that will be sure to give you excellent overall protection. With an adjustable under the chin strap and a floatable foam core, there’s no way you could lose this hat on the trails or in the water. This hiking hat is a versatile hiking hat with incredible UV protection and overall coverage. Whether you’re hiking the trails, fishing on the river, or working in the yard this hat is ideal for all your outdoor activities. The best part about this hat is – this one is truly a stain resistant hat. So, you can use it most often, and still, it will appear to be new. It’s more like a one-time investment that you are not going to regret afterward. Related: People who buy this hat also purchase the Sun Gloves with UV shield. With a 50+ UPF, it is likely to protect your hands from all the harmful effects of UV rays. Antimicrobial, breathable, and wicking, these gloves are comfortable to wear as well as maintain. The gloves tend to fit your hands swiftly and can be used very actively. This Sunday Afternoons Ultra Adventure Hat is something that you can totally rely on during your adventurous journey. Neither sun nor sweat will trouble you when you have your head protected with this hat. The most beautiful thing about this hat is that it almost looks like a traditional baseball, but boasts all the excellent features of a high-quality hiking hat. It comes in three attractive colors, gray, blue and white and is made out of 88% nylon and 12% polyester, making it extremely durable and lightweight. You won’t have to worry about sweating in this hat because it’ made with airflow in mind with a crown ventilation system, and a wicking sweatband to prevent any drips from getting into your eyes. The folding clamshell brim only increases this hats durability and ability to fold down into compact backpacks. The clamshell brim also allows you to customize how you need the brim to fold over your face to keep the sun out of your eyes no matter where it is in the sky. Speaking of the sun, this hat has an excellent UPF 50+ rating that will block all of those UV rays from getting to your face or neck. To top it off, this hat comes with a nifty sunglasses lock to keep those pesky sunglasses in place as you’re hiking. This is a high quality and very durable hiking hat that will be sure to keep you cool year after year. Related: People who buy this hat also consider the Sunday Afternoons Child Unisex Play Hat as an option for their kids. 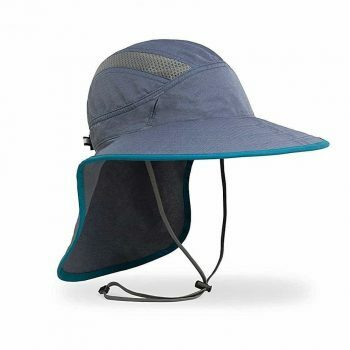 100% Nylon, this has a down sloping brim which keeps your face protected even in the hottest weather. The 5.5 neck veil covers the neck portion from backside and it does have 50+ UPF. This is one of the most durable hats on this list because of its 100% nylon construction. You won’t have to worry about any rips or tears here. It even folds up easily into a compact size so you can take it with you wherever you go. The Columbia Sportswear Bora Bora Booney II rating blocks out 98% of the sun’s harmful UVA and UVB rays, and even carries the Skin Cancer Foundation’s seal of recommendation, providing you with the highest available quality in sun protection. It’s extremely lightweight and has both a sweatband and mesh vent to keep you cool on your hottest hikes. The best part? This hat is waterproof and dries within minutes of you accidentally falling into the water. This hat is an excellent option for hikers and water lovers alike to keep you dry and comfortable on your outdoor adventures. Related: The Columbia Men’s Watertight II Rain Jacket is one of the highly bought products with this hat. The jacket is 100% nylon with zipper closure and waterproof covering. Comfortable to wear, the fabric is excellent to keep you cozy on the hiking trips. 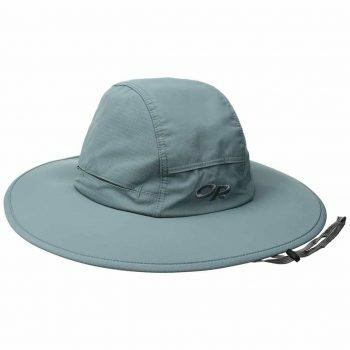 The great thing about the Outdoor Research Solar Roller Hat is its lightweight and breathable nature. You know it’s a durable, high-quality hat because it’s made from 100% nylon, guaranteeing you’ll get several years of use if you take good care of it. The sun protection is not the best as it doesn’t have a neck cape and only a UPF 30+ rating, but it will still get the job done. It has an adjustable and external drawcord making it perfect for windy hikes, and people who are prone to losing hats. The wicking headband will catch all your sweat before it drips on your face, keeping your head cool and breezy all day long. This hat even boasts a floating brim, so you don’t have to worry about it sinking to the bottom of lakes or rivers. We think this is one of the best hats in the market providing a floating brim. Also, it is going to cover your face good enough to protect it from sunburn. Related: People, who buy this product, often buy the Outdoor Research Sun Runner Cap with it. The cap features Supplex nylon, with convertible design, removable sun skirt snaps, light fabric, and mesh covering. With 30+ UPF, this mesh is considered one of the best to use amidst the scorching sun. 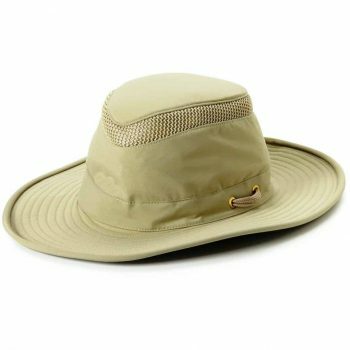 This sun hat is one of the most affordable and comfortable ones in the market. 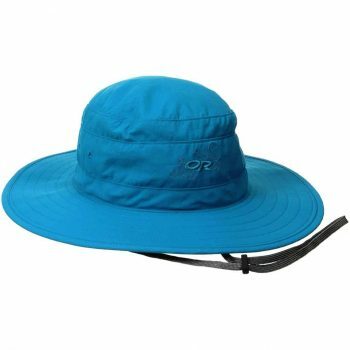 The Outdoor Research Sombriolet is one of the best hiking hats on this list for sun protection. It boasts a wide rim of six inches that is sturdy, yet flexible and never floppy. It’s extremely durable constructed with a nylon polyester blend and a ripstop crown that prevents tears and holes before they happen. 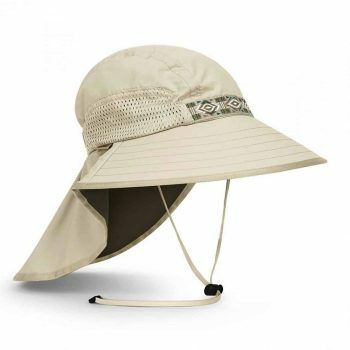 This hat is perfect for those hiking in extremely hot weather climates with intense sun, heat, and humidity. With its UPF 50+ rating and broad brim, you can be sure that your head, face, and neck will be protected from the sun’s UV rays all day. It has moisture wicking abilities that don’t absorb sweat or rainwater. With its lightweight construction, vents and mesh lining this is one of the most breathable hats on the market. 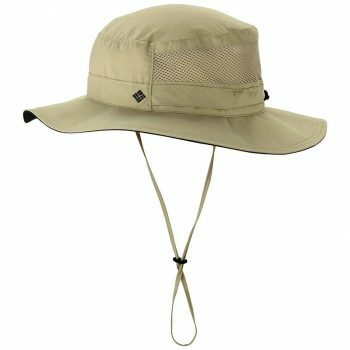 The next time you decide to go hiking in the desert or tropical rainforest (or just having some fun out in the sun), make sure you bring an this hiking hat with you, and your head will thank you. Related: People who bought this product also buy Outdoor Research Kid’s Ramble Sombrero Hat. The UPS for this hat is 30+ with stiff brims that even holds the capacity to float. The external draw cord adjustment and break away ensures the hat sits around you comfortably. The Tilley Endurables Airflo Hat does just what the name suggests and is constructed with a great, 3/4 inch polyester mesh in the crown to keep you cool and sweat free. This hat is designed with a medium sized, Aussie style brim and a UPF 50+ rating to protect your face and neck from the sun. It’s constructed with Tilley Nylamtium, making it highly durable and flexible. You can pack this hat into a backpack or suitcase and not worry about creasing or damaging it. Other excellent features of this hat include a dark under brim that protects your eyes from glares, a floatable foam rim, and a secret pocket in the crown that is perfect for stashing small items like a license, credit card, or cash. The adjustable strap stays in place during windy days. This hat is a very durable and breathable hat that is made of excellent quality and guaranteed to last you a very long time. We kind of like this hat, but it comes at the upper side of the price list. Hiking hats are an essential part of any hiking trip. They protect your head, face, and neck from harmful sun damage, and keep you cool and sweat free. Bear in mind things like style, durability, protection and comfort when searching for the perfect hiking hat for you. With this guide on buying a quality hiking hat and our curated list of the best hiking hats available, you can now easily find a durable and comfortable hat for your next outdoor adventure. So what’s your go-to hiking or camping hat? Let us know in the comments!